Ok so tonight was the first 12 of the top 24. This year's show is going to be good. The first two performances weren't very good but still, they weren't very bad either. The french girl I didn't know much about did a great Elvis impersonation. Then, the bloke did Blue Rodeo's "Lost Together" and it was not that great. The dude from Northern BC, Gary Morisette was rocking. He's class and did a guitar solo so I love that he just went for it. Really original voice and great energy. He actually destroyed it. Tatiana was also really good. She reworked "Feelings" into a sultry 70's lounge type tune. Really good stuff. Her and Gary were both really strong. Mitch MacDonald from Cape Breton was also good. Lots of seasoned performers this year. But he did a Gavin DeGraw song... country ain't my thing. He should have done "Save a Horse, Ride a Cowboy" by Big and Rich. Paul Clifford from Port Moody was great in auditions. He has an insane growl to his voice but he song choice wasn't outstanding. He didn't let it rip though and that's a problem in this type of competition. Some time people should not play the guitar and just stand up and sing. The competition really started when Earl blew up "All Along the Watchtower". He's really good. I thought Lisa Bell had great funk and energy when she did the Doobie Brothers "Long Train Running". Mookie was sweet and he actually was named after Mookie Wilson who made a hit win the game against the Blue Jays as he was born. He did Twist and Shout. Honest to God. It was really good. He also got an interesting voice and I thought he killed it. This kid could lead a band someday. 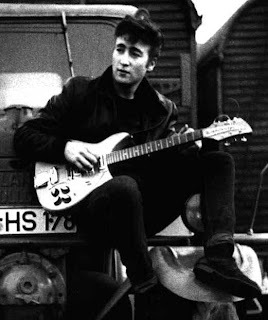 And he used a classic Rickenbacker, the kind of guitar John Lennon used to play. In fact, the Beatles have a strong connection to that brand. Zach commented he's get the record deal so far and I have to say there are a few people in this year's competition that could be signed already. ©1999 Astrid Kircherr. Used with absolutely no permission. I was really impressed with Drew Wright in the auditions and felt he was going to go far. He did Queen's "Under Pressure" and it he hit the crazy shreeking note at the middle. But the rest was flat for me. He's not going to peak early. The Pigot brothers are both good and seasoned performers. The older one, Oliver was pretty raw and did a good number of him pumps. The ladies loved that. Some great energy to this point. The french girl Katherine St-Laurent has an unreal voice and did "Total Eclipse of the Heart". That is probably one of the frenchest last names out there too. She has great tone and could actually sing much harder than she did. She was actually amazing. Way more good performances than bad. Better so far than American Idol was this season so far.